ASME first issued a Boiler and Pressure Vessel Code (BPVC) almost 100 years ago to support safety requirements and encourage technology development. 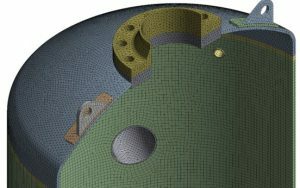 Today, ASME VIII is the most used code for designing pressure vessels, with 3 Divisions covering specific applications and approaches. Furthermore, ASME VIII is also frequently applied by engineers when assessing a wide range of other structures. Why Apply Design by Analysis within ASME VIII Div. 2? There are a number of reasons why Design by Rules may not be sufficient when designing and assessing structures. This independent, software-neutral course will give you a concise and practical introduction to the scope and purpose of ASME VIII Div. 2: Design by Analysis rules and how to meet their requirements using Finite Element Analysis (FEA). Operators, manufacturers, consultants, designers and engineering managers who are involved with ASME VIII standards regarding the design and construction of pressure vessels and related equipment. In addition to presentations, this practical course will include standard workshops and examples using ANSYS Mechanical FEA software. However, no prior experience in ANSYS is required.